The technology to generate HDR is technically pretty simple. Resolution is basically just a combination of bandwidth allocation and sensor size. HDR is different because it effects colour spacing, and the evolution of colour space in terms of HDR can, unlike SDR, be disruptive. When we started with 4K UHD displays, they did precisely what was intended. But when HDR came along, those who tended to cover live events with high-end UHD 4K cameras soon found themselves struggling to cope for any extended period of time with the blazing bright images directly in front of them, and there’s typically little or no respite from that when you’re live. That’s when customers started coming to us looking for a solution to the deep-fried eyes syndrome they were experiencing when working with HDR content. They needed operators to be able to stick with their respective display for more than half an hour or so. We explained to our customers who were having issues with HDR displays that we had developed an alternative. 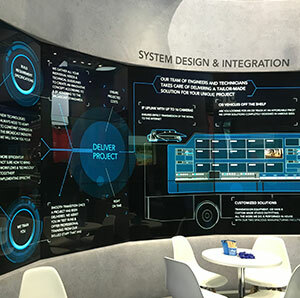 Our goal was to produce displays that were as close to reference standard colour space as possible, but with a backlight that was not as bright and could therefore be extensively used in a day-to-day working environment. What we did is take our normal displays and run a special interpolation over our lookup table so we get the full HDR colour spectrum on a normal LCD panel with 450 candela backlight. It’s easy to see (literally) that at half the brightness of a similar OLED panel it’s much easier on the retinas for long hours. Our “HDQLINE” display is very, very close to displays that feature top-of-the range colour space, but without the glaring white, or the price tag. Everyone we demonstrated it to was very impressed. Our HDR-ready HDQLINE is that delivers a comfortable working environment to those who want to produce HDR content. We’ve clearly demonstrated that we can supply a display that, on a daily basis, works for people without requiring them to incur the cost of very expensive sunglasses. The monitor wall for the host broadcaster main operations compound of this summer’s major sporting event in Russia will consist entirely of sonoVTS HDQLINE displays, and they will be HDR-ready monitors. The future for HDR is bright, but with HDQLINE, there’s no need to wear shades.